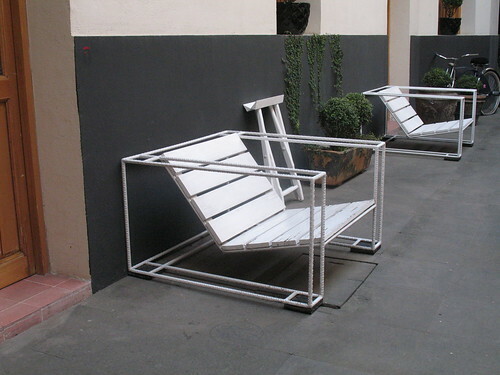 Outdoor chairs made very simply from welded rebar and wooden planks. The little folding perch is clever too. If you’re from DF and you know the name of this designer, please remind me. The studio is at Chihuahua 78, between Cordoba and Merida. UPDATE: Thanks, Alejandro: the designer is Hector Galvan and the company is Omelette. This entry was posted on Wednesday, May 19th, 2010 at 9:53 pm	and is filed under design. You can follow any responses to this entry through the RSS 2.0 feed. You can leave a response, or trackback from your own site. Thank you! You’re right. There’s some interesting stuff on that site – the renewal of Regina Street was an interesting project. PS Omelette is just downstairs from Carla Fernandez’ boutique. I liked her support of traditional weavers.